East Meets West Gallery, together with the All-Russian Museum of Decorative, Applied and Folk Arts present a group art and music show “Color, Line and Sound”, which will run at the Balcony Hall of the Museum from March 4 to April 13, 2016. Easel painting and graphic works of Elena Utenkova- Tikhonova and Mikhail Tikhonov gallery shows for the first time, that in itself is interesting. The familiar visual images of the artist’s works will be paired with avant-garde and minimalist music pieces by contemporary Russian composer Pavel Karmanov, who is a full participant in the show. The addition of the visual images to music brightened what art historian Vitaly Patsukov called rhythm and energy of form, meditation of sounds, space responses, whispers of Nature in Mikhail Tikhonov`s works. Elena Utenkova-Tikhonova`s Spring landscapes were also well combined to Pavel Karmanov”s pieces, such as “Spring in January” thanks to their multilayered transparency, saturation and depth. Transformation of the Balcony Hall into a space inspired by airy and fluid atmosphere, containing the artists’ best works has led to combination of Color, Line and Music in one exhibit. The show was also complemented by poetic texts from the books by Elena Utenkova-Tikhonova “Spring. Summer. Autumn. Winter.” and “Christmas Tree in the Room”. 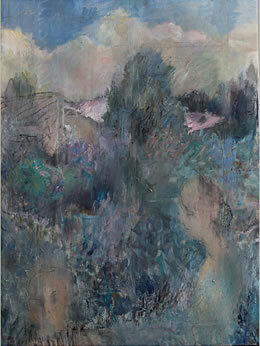 Elena’s landscapes hold lots of personal space, personal experiences. They reflect the artist’s feelings and exist outside of time. That is why the artist’s world is very much related to poetry and music. In her pieces “Garden in spring”, «Spring Twilight,» «Evening» the World of Nature which is closely combined to the World of Human being. This world stands out in blur, misty, elusive space, which is not easy to understand. Mikhail Tikhonov expresses the same ideas even brighter. He creates a space that breathes, flows, changes and as though floats, and sometimes opens up to us. Michael invites you to enter his World, but enters only one who sees. Art historian Vitaly Patsukov called it «gravity», “the effect of reverse perspective”. One of the main tools that Michael often uses to create an image and an object in space is a Line. The artist considers a Line «as the nerve, as part of the Universe…» The Line sometimes resembles a suddenly broken string, a panicky syncope or a spiral cable. Lines are few in his works, and each line creates an image. 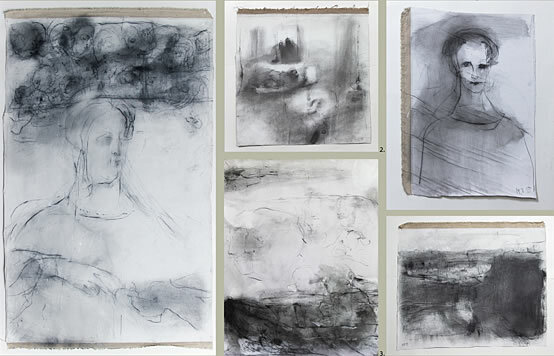 The images live in different spaces and planes but the artist’s favorite is the transparent plane, which creates a unique lightness of the composition (“Swing”, “The room”, and others). Musical compositions by Pavel Karmanov: «Different rains» – composition for piano, flute with audio recordings of rain (1996). Maria Fedorova and Polina Osetinskaya; «Spring in January» – composition for viola, piano with The Symphony orchestra (2005); Symphony orchestra «New Russia», solo violin – Yuri Bashmet; The Sextet «The City I love and hate» – composition for piano, string Quartet and double bass (2012). East Meets West Gallery, together with the All-Russian Museum of Decorative, Applied and Folk Arts present a group art and music show «Color, Line and Sound», which will run at the Balcony Hall of the Museum from March 4 to April 13, 2016. Easel painting and graphic works of Elena Utenkova -Tikhonova and Mikhail Tikhonov gallery shows for the first time, that in itself is interesting. The familiar visual images of the artist’s works will be paired with avant-garde and minimalist music pieces by contemporary Russian composer Pavel Karmanov, who is a full participant in the show. The addition of the visual images to music brightened what art historian Vitaly Patsukov called rhythm and energy of form, meditation of sounds, space responses, whispers of Nature in Mikhail Tikhonov`s works. 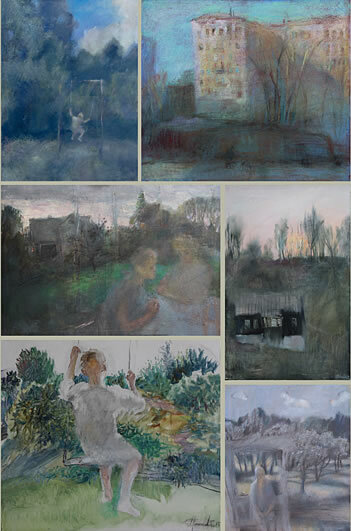 Elena Utenkova-Tikhonova`s Spring landscapes were also well combined to Pavel Karmanov”s pieces, such as «Spring in January» thanks to their multilayered transparency, saturation and depth. 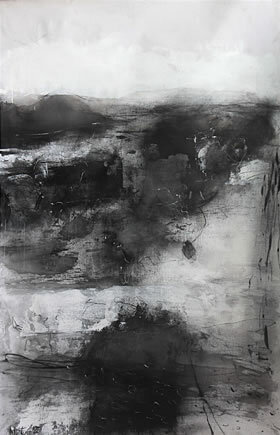 Elena’s landscapes hold lots of personal space, personal experiences. They reflect the artist’s feelings and exist outside of time. That is why the artist’s world is very much related to poetry and music. In her pieces “Garden in spring,” “Spring Twilight,” “Evening” the World of Nature which is closely combined to the World of Human being. This world stands out in blur, misty, elusive space, which is not easy to understand. Mikhail Tikhonov expresses the same ideas even brighter. He creates a space that breathes, flows, changes and as though floats, and sometimes opens up to us. Michael invites you to enter his World, but enters only one who sees. Art historian Vitaly Patsukov called it “gravity”, “the effect of reverse perspective”. One of the main tools that Michael often uses to create an image and an object in space is a Line. The artist considers a Line “as the nerve, as part of the Universe…” The Line sometimes resembles a suddenly broken string, a panicky syncope or a spiral cable. Lines are few in his works, and each line creates an image. The images live in different spaces and planes but the artist’s favorite is the transparent plane, which creates a unique lightness of the composition (” Swing”, “The room”, and others).